I started at Christ Church at Grove Farm (CCGF) in Sewickley, PA, as the Creative Services Director about 10 years ago. We are an evangelical non-denominational church with roots in the Anglican tradition. We had just dedicated our new, larger sanctuary that had been added to the existing building, which had effectively doubled our size. We currently run three services on Sunday, with two of the three services having a more modern, rock-driven, multimedia heavy feel. We have a typical layout of three screens with a conﬁdence monitor in the back, and the ability to send three independent sources to the screens (main screen; side screens; conﬁdence monitor). We would run announcements on side screens, and church logos/images on middle screens. 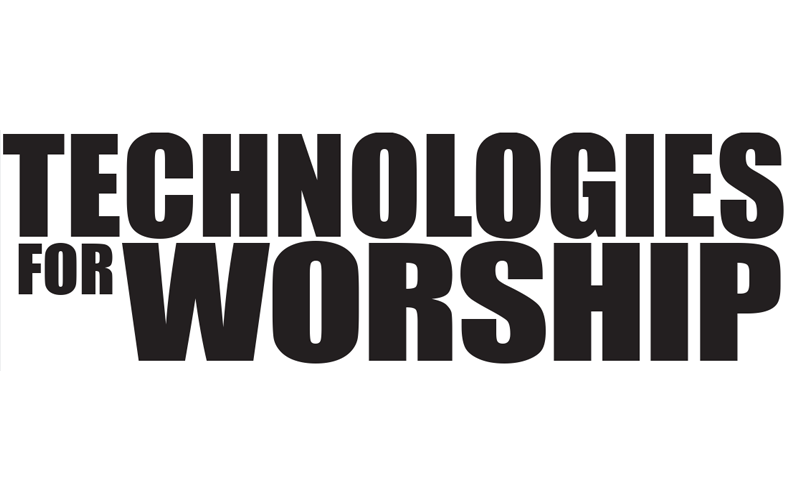 Worship songs would sometimes run on all three screens, or sometimes just on the side screens with some type of image/presentation on the middle. This works well with my own philosophy of doing live productions, as having three screens allowed us to open the stage and add great visuals. We were using Analog Way’s CentriX, but realized it was time to upgrade when, after ten years, the TripliX switcher controlling our three CentriX boxers, started freezing on us during service. Despite Analog Way’s excellent tech support, it was time to look for something new. We wanted to keep at least three outputs, and have the ability to run the image across all three screens (almost like edge-blending it) but also have the ability to run individual images as needed. Because we were familiar with Analog Way, and had had good experiences with their tech support, we decided to continue with their products. It was an easy choice to make, because they were really the only ones that had exactly what we needed at the time. They brought in the SmartMatriX Ultra (ref. SMX12x4) for a demo, and also allowed us to test-drive the product via a connection through their New York ofﬁce via RCS (Remote Control Software). The RCS is a web-browser based control network, and Analog Way gave us free access to log into their web server and play with the device. Tech Support was available every step of the way to walk us through the product, so we knew what we were getting and were familiar with the device before any money was spent. 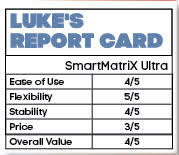 We currently use the SmartMatriX Ultra with six inputs on a regular basis. Our main graphics generator is Renewed Vision’s ProPresenter 6. The SmartMatriX Ultra allows us to use ProPresenter’s main output, as well as its “Stage Display”. The ease of switching with the SmartMatriX Ultra allows us to ﬂip between all inputs seamlessly. We can also put the pastor’s sermon notes on the conﬁdence monitor, with a countdown clock overlaid via separate layer thanks to the SmartMatriX Ultra’s multiple layers option. Also, we use the Memory and Master Memory options heavily. These allow us to present all the attributes of a given screen or all the screens at once. 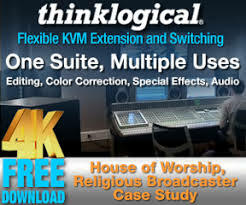 So, if the next switcher move is to put a motion video on the center screen, the lyrics on the side screens, and the Stage Display output with a separate overlaid countdown clock to the conﬁdence monitor, the Master Memory allows us to literally click one button to get all that set up, rather than having to set up each screen and each layer individually. It’s a real time saver, and also allows us to use volunteers with little or no experience on the switcher. We are barely scratching the surface of what the SmartMatriX Ultra can do (PIP, IMAG, overlays, etc. ), but we purchased it with future use in mind, so it can grow with us. We can have multiple computers logged into the SmartMatriX Ultra if we need to, controlling different screens, but we normally just have one person pulling all the feeds into it and running the switcher on Sunday mornings. Another thing I like about the SmartMatriX Ultra is the redundancy it’s capable of. We currently program two computers; one for main, one for standby; and the SmartMatriX Ultra makes it really easy to jump if we need to. If we have to switch from one to the other, it’s such a seamless transition no one would ever know we were having issues. 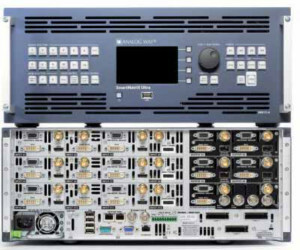 We do everything we can in HD – we currently have “Standard Deﬁnition Image Magniﬁcation” capability (which we don’t use on a weekly basis, only on special occasions) but we can run both HD and SD inputs into the SmartMatriX Ultra, and it does all the switching and scaling internally. Our older system ( CentriX) had 5 components – three CentriX, the universal booster and the control surface called the triplex that controlled them all. 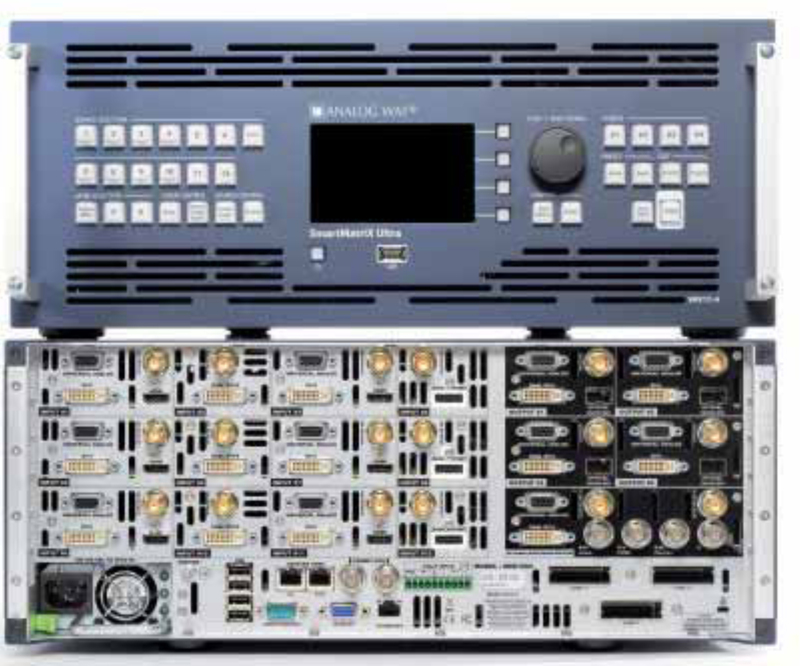 The SmartMatriX Ultra Ultra is just one piece of gear, so it’s freed up a lot of space on our rack. Because it can do so many things, there’s deﬁnitely a learning curve but once you get the hang of it you can simplify it for volunteers. And the more we use it, the more we really start to see what can be done with it. For example, one of the things I was really excited about was that it has four outputs instead of three – we haven’t had the opportunity to use all four yet on a regular basis, but we recently had a big arts night for a local ministry and they requested three different images on the three different screens plus the conﬁdence monitor – so were able to use all four outputs. 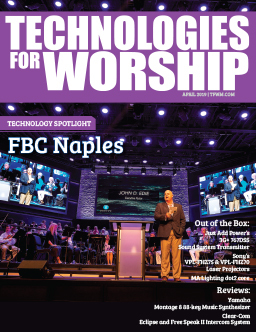 As our church grows and our needs change, we talk all the time about whether we can do two different types of services in one space, and the answer prior to the SmartMatriX Ultra was no, not possible. However, with the ﬂexibility of the SmartMatriX Ultra, we could do two services almost back to back – even if the tech was completely different – we would have no problem doing that. The ﬂexibility is great, and I feel like I can say yes when different creative ideas come up, that we’ve never been able to do before, such as running unique feeds to the three front screens to create an apparently continuous image. I can now spend less time thinking about the technical limitations, and more time implementing new ideas visually, to the point that we can push the limits creatively without having to worry about not having the tech to do this.